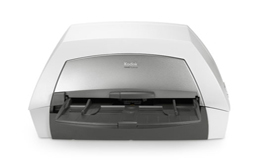 The i1440 is a 75 ppm Duplex (Portrait) departmental color scanner with a 150 page Automatic Document Feeder and advanced image processing features. The i1440 allows for the capture of documents in Color, Bi-tonal or Grayscale. 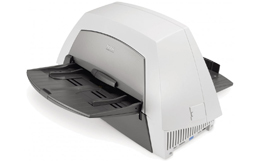 The ADF (Automatic Document Feeder) handles a wide range of document sizes and types with ease. This scanner comes equipped with a document printer; however, to utilize the printer, you will need to purchase an ink carrier and an ink cartridge (Both Sold Separately). Allows you to scan to file, e-mail, publishing or other desktop applications with just one click. Smart touch feature lets you easily choose the right scanning application to scan documents to e-mail, file, publishing and other desktop applications that support TIFF, JPEG, RTF, PDF and searchable PDF. USB 2.0 interface provides fast image transfer. Post-scan document imprinter allows you to imprint tracking information directly on the document as it passes through the scanner. Toggle patch automatically switches between black-&-white and color scanning "on the fly". Delivers speeds up to 75 pages per minute/150 images per minute at 200 dpi. Handles up to 15,000 pages per day. Background color smoothing removes variations in background color for greater color consistency and reduced file size. Improved color accuracy enhances images with truer, more consistent colors. Automatic color detection outputs images in color, grayscale or black-and-white based on document content. Interactive color output adjustment compensates for variations in printers, displays and lighting conditions by allowing users to adjust brightness, contrast, and color balance. Automatic orientation rotates the scanned image correctly for reading based on document content. Improved and trainable electronic color dropout eliminates up to three irrelevant background form colors, plus "learns" up to three colors to drop out. Segmented black-and-white output optimizes the image quality of both text and photo regions independently, allowing photos to be rendered with more detail and clarity. Photo extraction automatically locates, extracts & outputs a photo as a separate image file. Physical dimensions 11.8 x 21.5 x 14.4 "
ADF Feeder Paper Size Min. - W x L 2.5 x 3.5 "
ADF Feeder Paper Size Max. - W x L 11.7 x 34 "